Photograph, Picture of Clifton "Cliff" Bruner with his fiddle. Image available on the Internet and included in accordance with Title 17 U.S.C. Section 107. BRUNER, CLIFTON LAFAYETTE [CLIFF] (1915–2000). 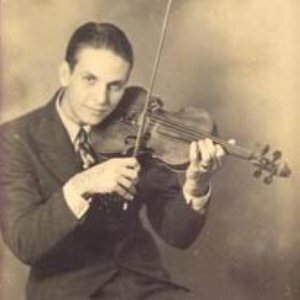 Clifton Lafayette (Cliff) Bruner, western swing fiddler and bandleader, was born in Texas City on April 25, 1915. Bruner's father worked as a longshoreman on the Houston docks but dreamed of being a farmer. Periodically he would take his dock money and lease land or sharecrop. On one such venture, when Cliff was five years old, the family moved to Arkansas. While playing in their farmhouse, Cliff found a fiddle. As he recalled later, "I got the thing out and I was sawing on it and my grandmother, who was living with us at the time, said, 'That sounds like a tune that I've heard before. '…That's when I started playing. I was playing fiddle before I could talk good." The Arkansas farm eventually failed, and the family moved to Tomball, Texas. Bruner's playing ability led him to perform for family and friends. 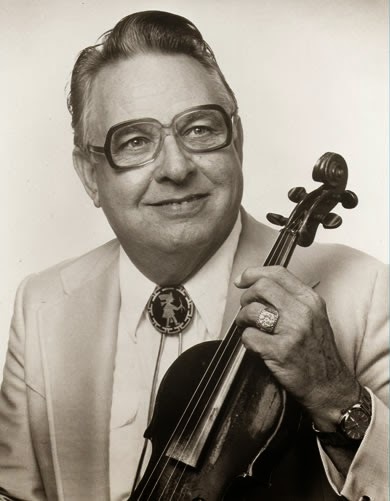 Like many western swing violinists from a rural background, Bruner learned to play by listening, watching, and improvising. The only formal music training he ever received was from a Texas-Mexican musician who spoke no English and played only Mexican music. Through this training, however, Bruner was exposed to one of the distinctive threads of Texas musical culture woven into Texas jazz. While still in school, Bruner played at local dances and eventually toured with Doc Scott's medicine show. In 1935 he joined Milton Brown and His Musical Brownies, a swing band based in Fort Worth. Brown was the first Texas bandleader to use twin fiddlers. He paired Bruner with Cecil Brower, and this duo became the trademark sound of Brown's music. Bruner recorded forty-eight sides with the Brownies on the Decca label. The band's promising future ended with Brown's untimely death in 1936, whereupon Bruner moved to Houston and formed his own band, the Texas Wanderers. Musicians who played with this band included steel guitarist Bob Dunn, electric mandolinist Leo Raley, fiddler J. R. Chatwell, guitarist and vocalist Dickie McBride, and country boogie pianist Moon Mullican. The band became one of the most popular and successful Texas Gulf Coast ensembles. It broadcast regularly on radio station KXYZ in Houston, and later on KFDM in Beaumont. Between 1937 and 1941, in numerous recording for Decca Records, the Wanderers turned out such hits as a version of Floyd Tillman's "It Makes No Difference Now" and the first truck-driving song, Ted Daffan's "Truck Driver's Blues," with vocals by Bruner and Mullican. Photograph, Picture of Clifton "Cliff" Bruner in his later career. Image available on the Internet and included in accordance with Title 17 U.S.C. Section 107. During his long career, Bruner formed several bands, most called the Texas Wanderers. He also played with other groups, including those of W. Lee "Pappy" O'Daniel and Jimmie Davis, who used their bands to promote their political campaigns. In the 1950s, due to his wife Ruth's illness, Bruner dissolved the Wanderers and sought a more stable occupation in the insurance business. The Bruners were living in Amarillo when Ruth died. Left with two small children to raise, Bruner returned to Houston, married a second woman named Ruth, and continued to work in his own insurance company. He pursued music on the side, playing on weekends with local musicians. He died of cancer on August 25, 2000, and was survived by his wife, six daughters, seventeen grandchildren, sixteen great-grandchildren, and five great-great-grandchildren. Bruner was inducted into the Texas Music Hall of Fame and the Western Swing Society Hall of Fame, as well as the Texas Western Swing Hall of Fame. Jean A Boyd, The Jazz of the Southwest: An Oral History of Western Swing (Austin: University of Texas Press, 1998). Houston Chronicle, August 27, 2000. Handbook of Texas Online, Ruth K. Sullivan, "BRUNER, CLIFTON LAFAYETTE [CLIFF]," accessed April 24, 2019, http://www.tshaonline.org/handbook/online/articles/fbrdz.